The Rock of Cashel (Carraig Phádraig), more formally St. Patrick’s Rock, it is also known as Cashel of the Kings. Reputedly the site of the conversion of Aenghus the King of Munster by St. Patrick in the 5th century AD. Legend associates the Rock of Cashel with St. Patrick, but the name comes from Caiseal, meaning “stone fort,” and the hill was originally the residence of the kings of Munster. Excavations have revealed some evidence of burials and church buildings from the 9th or 10th century, but it was in the early 12th century that the Rock began to be developed into a major Christian center. In 1101, Muirchertach O Briain, king of Munster, gave the Rock of Cashel to the church. A round tower, which still stands today, was erected shortly after this. A decade later, in 1111, Cashel became the seat of an archbishop. (At the time there was only one other archbishop in Ireland, located in Armagh.) The original cathedral was located where the choir of the present one now stands, but nothing is known of it. Cormac’s Chapel, a magnificent little Romanesque church that still survives today, was consecrated in 1134, probably for Benedictine monks. The town of Cashel at the foot of the rock was founded by the archbishop sometime before 1218 and a Dominican priory was established in 1243. The present cathedral was erected in the 13th century as well. The frescoes in Cormac’s Chapel, which are the oldest Romanesque wall paintings in Ireland, were covered with whitewash at the Reformation (16th century) and remained hidden until the 1980s. Visitors enter the Rock of Cashel complex through the Hall of the Vicars Choral, built in the 15th century. The vicars choral were laymen (sometimes minor canons) appointed to assist in chanting the cathedral services. The Hall was restored in connection with the European Architectural Heritage Year (1975) and contains a small museum of artifacts excavated on the Rock of Cashel. The earliest and most lofty of the Cashel edifices is the round tower next to the cathedral’s north transept. It originally faced the west end of the 12th-century cathedral. Rising 28 m (90 feet) high and dating from shortly after 1100, it is a well-preserved example with six floors. Only the roof has been rebuilt, in the 19th century. The Chapel of King Cormac or Cormac’s Chapel was consecrated in 1134 and is the most important building, historically and architecturally speaking, at Cashel. Begun in 1127, it is a very sophisticated structure, unlike most Irish Romanesque churches which are very simple in plan with limited decoration. It has two square towers flanking the east end of the nave, which may suggest Germanic influences or may be an adaptation of the Irish round tower. The exterior of Cormac’s Chapel is beautifully decorated with typical Romanesque details such as repeating blind arches and carved corbels. The south portal has two zigzag arches and a tympanum with a relief of an animal. The north portal has a gabled porch, indicating it was the main entrance before the cathedral was built up against the north side of the chapel. The chapel’s interior contains the oldest and most important Romanesque wall paintings in Ireland. The oldest, dating from about 1134, consist mainly of masonry patterns and can be made out in places on the lower walls. The remaining paintings date from c.1160-70 and are visible on the upper walls and vault. These depict narrative scenes such as the Nativity, and their sophistication suggests the artists were from England or Normandy. At the west end of the chapel is a beautifully-carved sarcophagus that may be the tomb of Cormac himself, or maybe his brother and predecessor, Tadhg (d.1124). Its decoration is in the Hiberno-Scandinavia Urnes style of the early 12th century, featuring interlaced beasts and serpents. The sarcophagus probably originally stood in the 12th-century cathedral, which no longer survives. The tomb was discovered in the north transept of the present cathedral in the 19th century. The cathedral, built between 1235 and 1270, is an aisleless (and roofless) building of cruciform plan with a central tower. The nave is much shorter than the choir and clearly was never completed. The short nave was reduced a bit more in the 15th century, when a five-story castle (tower-house) was added to the west end as a residence for the archbishop. The castle was accessed on the second floor from the passage in the nave walls. The most attractive elements are the transepts (c.1270), with triple lancet windows. On the east side of the transepts are square chapels, two on each side, all with piscinae and three with tomb niches. The north transept contains late medieval tombs and grave slabs found at the site. The long choir is elevated at the east end and contains grave slabs dating mostly from the 16th century. The south wall of the choir contains a piscina, sedilia, and wall tomb of the late 16th-century archbishop Miler McGrath. Throughout the structure, it is possible to discern the dates of the decorative elements based on the material used: the original 13th-century work is in sandstone, while later work is in limestone. The grounds around the buildings are home to an extensive graveyard, which includes a number of beautiful high crosses. The entire plateau atop the rock is walled. Visible from the west side of the Rock are the desolate ruins of Hore Abbey, a Cistercian foundation of 1272. Near the base of the hill in the town of Cashel is a ruined Dominican friary, which was founded by the archbishop in 1243, renovated after a fire in 1480, and dissolved in 1540. The monastic buildings have not survived but the church walls are mostly intact. Dating from the mid-13th century, the church is notable for nine lancet windows on the south wall of the choir, which are thought to be the earliest examples of a design seen at other Dominican foundations in the area (namely Athenry, Sligo, Ardfert and Ferns). The windows in the east wall, south transept and west gable date from the mid-15th century. The transept, added c.1270, is one of the earliest examples of the “preaching transepts” that became a common feature in medieval Dominican churches. Located at the foot of the historic Rock of Cashel, the Brú Ború shows of traditional music, song and dance run for five nights each week (Tuesday – Saturday inclusive) beginning in late June right up until late August commencing at 9p.m. The unique Brú Ború performing group have achieved international recognition on five continents. They are in constant demand throughout the world because of their performance of Irish authentic traditional music, song and dance. The group have accompanied President Mary McAleese to Oman where they performed for the Sultan of Oman. They also represented Ireland at the World Expo on four occasions in Osaka Japan, Seville in Spain, Nagoya Japan and a group of 30 artists accompanied President Mary McAleese to Shanghai, China for the 2010 World Expo, where they presented their show for President Mary McAleese and her Chinese hosts on Ireland’s National Day. Most recently members of the group travelled to Lesotho where they performed for St. Patrick’s Day 2012 and had the honour of performing for the King of Lesotho. This group comprises the very best and most talented of musicians, singers and dancers. Enjoy an evening of live traditional entertainment with renowned accordion player Bobby Gardner, the delightful airs of fiddler Eileen O’Brien and Tipperary’s finest singers Nora Butler and Tadhg Maher, just to name a few. The show is delivered with verve, colour, panache and style in the intimate settings of the Brú Ború theatre, but the night does not finish there! Following on from the stage show, performers and visitors mingle in the Teach Ceoil for some more entertainment where visitors can dance a jig, sing a song or play a tune – a lively Cashel set or Siege of Ennis often requires a visit to the adjoining bar, you can also enjoy tea or coffee and a scone. Prior to the evenings entertainment why not avail of our restaurant facilities. Enjoy fine food with good friends in the awe inspiring atmosphere of the Rock of Cashel. Irish recipes, home baking and good fresh produce are the ingredients which combine to make a dining experience in Brú Ború a memorable one. (Pre- booking is required for the restaurant). Brú Ború also incorporates the “Sounds of History” cultural exhibition. The subterranean chambers, seven metres underground at the base of the famous Rock of Cashel, echo to the story of Ireland from ancient times to the present day. Through the passage of time, the visitor’s journey is marked by milestones of achievement, conflict and renewal. The facilities in Brú Ború also include Genealogy services for South Tipperary; Teach Ceoil; Restaurant; Bar facilities; Conference Rooms and the Comhaltas Archive. It is for these reasons that many describe a visit to Brú Ború as ‘the highlight of their stay in Ireland’. Why not pay a visit to Brú Ború, this oasis of art and culture situated at one of the most hallowed spots in Europe is sure to be a memorable experience. A Céad Míle Fáilte Awaits You! FOUNDED in 1243 by David Mac Kelly, archbishop of Cashel, “who while dean of Cashel joined the Dominicans of Cork as a member of the Order and out of that community supplied with members a little monastery which he had built at Cashel. 1250. June 13. The King writes to the archbishop of Dublin begging that the Crusade be preached in Ireland. He also writes to the archbishop of Cashel and adds that the Pope’s letters, which Walter Maunsel is bringing to the archbishop, are to be placed after their publication, in the custody of the Friars Preachers of Cashel. 1256, June 30. A provincial chapter was held here. Provincial chapters were held here in 1289 and 1307. 1394, July 15. John O’Grady, archbishop of Cashel, was buried in this abbey. 1480. An accidental fire having destroyed the abbey, it was re- built by John Cantwell, the archbishop, who was constituted both patron and founder, by an instrument dated at Limerick, about 1480, and by the same instrument it was declared that he and all assisting him in the good work would be partakers of all the suffrages of the Order in Ireland. The document purports to emanate from John Frickery, vicar-general of the Dominican Order in Ireland, William Duff de Burgo, prior of the house, and the community itself. 1535. Edward Brown, the prior, on the vigil of Easter, demised to Peter O’Cuil, priest, a messuage of Cashel for the term of sixty years, at the annual rent of six shillings and eight pence, Irish; and on April n, 1536, the said Edward demised to Walter Fleming of Cashel, two messuages and two acres, with their, appurtenances in the said town, for the term of sixty years, at the annual rent of sixteen pence; on April 8, 1540, the said Edward “surrendered” this friary, containing a church and belfry, a dormitory, a chamber with two cellars, a cemetery, two orchards, and two parks or gardens containing two acres, etc., etc. 1543, May 5. Grant to Walter Fleming, of Cashel, merchant, for 46. of the site of the monastery of Friars Preachers of Cashel. 1544, Mar. 8. This friary (tithes excepted), with its appurtenances, and four gardens in Cashel, were granted for ever to Walter Fleming, in capite, at the annual rent of two shillings and sixpence, Irish money. In 1756 there were five fathers attached to the convent of Cashel, but only one in 1800. The death of a Father Cantwell is mentioned in the obits in 1843. The last Dominican of Cashel was Father Conway, who was still there in 1850. Cashel Folk Village/1916 Easter Rising Museum is a MULTI/AWARD WINNING MUSEUM. Ranked as the NO. 1 Museum in Co. Tipperary on Tripadvisor, and winner of the internationally recognised Tripadvisor Certificate of Excellence every year since its first year of entry on Tripadvisor. Cashel Folk Village/1916 Easter Rising Museum has also been independently described as A ONE/STOP/SHOP HISTORICAL MASTERCLASS in The Public Sector Magazine in the section called TAKE THE TOUR, covering , as it says itself, some of the best educational tours on offer to schools throughout the country.In the issue related to, it was one of the two sites recommended throughout the whole of Munster, the other recommended site being The Great Blasket Centre in Co. Kerry. The real highlight of this museum, particularly because 2016 is the 100th Anniversary of The 1916 Easter Rising, is that it offers visitors the opportunity to see the ONLY 1916 Easter Rising/Irish War of Independence/Irish Civil War Museum COMBINED in Ireland. It also houses the ONLY 1916 Easter Rising Garden of Remembrance/Memorial Plaza in Ireland. Significantly, a huge amount of the memorabilia/artefacts on site are ORIGINALS, not copies, making it A MUST SEE EXPERIENCE. The above list is only a small portion of the exhibitions/memorabilia to be marvelled at on site-plus you can also view what has often been described as the finest example of top quality THATCHED BUILDINGS to be seen anywhere in Ireland. If you have a grnuine in REAL, UNADULTERATED IRISH HISTORY, then you will find that a visit to Cashel Folk Village/Museums to be a TRULY MEMORABLE EXPERIENCE, and something NOT TO BE MISSED. The Back of the Pipes dates back to 1842- it was built by the Commissioners of Cashel to provide a water supply to the town. It is situated on the Main Street, just across from Feehans Bar and the Cashel Tourist Office and Heritage Centre. At the time water was discharged through gargoyles into individual troughs. In 1986 the structure was restored and converted into a fountain. The City Hall was originally a market building. For several hundred years, it was the centre of administration for the town and surrounding areas. The building is now used as a heritage centre and tourist office. The award winning Heritage Centre and Tourist Office located on the Main Street should be your first stop in Cashel. A large scale model of the town in the 1640’s highlights the lesser known treasures of the town. Audio commentary is in French, Spanish, German, Italian, Irish and English. The Charters of Cashel, granted by Charles II in 1663 and by James II in 1687, are on permanent display, and are the only two remaining charters of Cashel to be found in Ireland. The Royal Charters hold the key to a long and fascinating story, the story of a town – a City that was really a republic. A Republic that lasted until the Corporation of Cashel was dissolved in 1840 – a period of 610 years. Usually subsequent Charters reaffirmed or confirmed all the privileges and charges of the Great Charter. Cashel known as the “City of the Kings” was only granted City status by the Charter of King Charles I in 1637. This status was applied to the town up until 1840. The Heritage Centre also has a craft shop, stocking local crafts, including Rossa Pottery and Fearney Castle Ceramics. A large selection of woollen sweaters, hats, scarves, linens, along with a wide variety of books that can be purchased, including Ordnance Survey Maps, CD’s, Tin Whistles, Jewellery and Souvenirs. Archbishop Thomas Croke served as Archbishop of Cashel and Emily, and is one of the founder patrons of our national sports body, the Gaelic Athletic Association (Archbishop Croke was originally Archbishop of Auckland in New Zealand, but subsequently became Archbishop of Cashel and Emly). In his honour, our national sports stadium, Croke Park, was named after him, to celebrate his part in the setting up of the G.A.A.. In 1895 the famous Croke Memorial was built in the main street in Cashel, to celebrate his Silver Jubilee. Unfortunately , this memorial was struck by a truck in the mid 1980’s, and was very badly damaged and broken. A replica cross was commissioned and built on the Main Street of Cashel. Martin O’ Dwyer the curator of Cashel Folk Village/1916 Easter Rising Museum at that time, requested permission to collect the pieces of the original cross. He had it rebuilt and restored and it now stands proudly inside the entrance to Cashel Folk Village/1916 Easter Rising Museum- a unique and proud testament to Cashel and Archbishop Crokes place in History. Kearneys Castle is situated on the Main Street, Cashel, almost directly opposite Cashel Tourist Office and Heritage Centre. In its chequered past this 15th century castle was used as a garrison by the infamous Lord Inchiquin – whose real name was Murough O Brien, – who attacked the town in 1647 and slaughtered 3, 000 of its inhabitants on the grounds of the Rock. The Kearney family lived in the building for many years. Fr John Kearney was hanged in the castle in 1642. The building now operates as a hotel, and is open all year round. It may be the oldest standing domestic building in Cashel, and is the only known survivor of a group of fortified urban houses in the town. The Cashel Palace Hotel was built in 1730 by Archbishop Theophilus Bolton. It was designed by Sir Edward Lovett Pearce who was also the Architect of the Old Parliament House in Dublin, which is now the Bank of Ireland, College Green. In style, it can be placed between Queen Anne and Early Georgian. The Cashel Palace Hotel is faced with red brick to the front and with limestone at the rear, making it a very rare and unusual feature for the period. A crowned harp is to be found over the entrance, this is a fire mark issued by the Hibernian Insurance Company of Dublin who was in business from 1771 to 1839. They were the first company in Ireland to transact Fire Insurance. The large entrance hall retains its original wood paneling, with two Corinthian columns. The magnificent staircase off the entrance hall is of Red Pine, in an early Georgian style with an intricate foliate design and superb examples of ‘barley sugar’ Banisters. This staircase leads to the upper floors where a selection of elegant, individually decorated bedrooms are offered. Some of these rooms were damaged during the Wolf Tone Rebellion of 1798. They were remodeled after 1800 in the Regency Style by the 1st Earl of Normanton, the then Archbishop of Cashel. Following a decision by Archbishop Richard Lawrence to transfer the Diocesan headquarters to Waterford in 1833 the Palace was divided for use by the Dean of Cashel and a Canon of the Church of Ireland. The decision was made by the Church to sell the property in 1959 and in May 1962 it was first opened as a Luxury Hotel by Lord Brockett, who also owned the Wicklow Hotel in Dublin and Benner’s Hotel in Tralee at that time. To the rear of the Palace are beautiful gardens, which include two ancient Mulberry Trees planted in 1702 to commemorate the Coronation of Queen Anne. The gardens also contain the descendants of the original hop plants used by Richard Guinness, an agent for Archbishop Price of Cashel in the 1740’s to brew the first “Wine of Ireland”. Mr. Guinness and his son Arthur went on to brew this beer in Dublin and to found the famous Guinness Brewery at St. James’ Gate. The garden also contains a private walk (The Bishops Walk) to the Rock of Cashel, the 13th Century Cathedral and the ancient seat of the Kings of Munster. The Palace is described as “a place of notable hospitality” in Loveday’s Tour of 1732. The fountain was erected in 1904 by the citizens of Cashel in honour of Dean Kinane. Dean Thomas Kinane was born in Arloman, Tipperary, in 1835. He studied in Thurles College for two years and in the Irish College in Paris from 1857 to 1861 when he was ordained by the Archbishop of Paris. He spent three years as professor of Philosophy in the College before being brought home to be C.C. in Templemore.In 1876 he was appointed to Thurles.He was sent as P.P. to Fethard in January 1878 and appointed Archdeacon six months later.During his time there he came to be called ‘The Tenants’ Friend because of his support for tenants in opposition to landlords who were only too ready to oppress and evict them. On coming to Cashel as Dean in 1888 Dean Kinane was not happy until he had the Parish Church and the church in Rosegreen renovated and improved.He had the church in Cashel re-roofed, the valuable high altar and side altars erected complete with communion rails, all in marble.A new floor was put down in the body of the church and new pine pews installed.He had new schools built in Cashel (The Green) and in Mocklershill and Templenoe.He bought the parochial house that was in John Street from John D. White, who was the agent for the Smith-Barry estates (and was responsible for many an eviction).Dean Kinane played a very large part in having the branch line brought from Gooldscross to Cashel in 1904.The fountain in Lowergate commemorates that event and Dean Kinane’s part in it.He had much to do with having the market cross set up to mark Archbishop Croke’s silver jubilee. Dean Kinane was a priest of outstanding piety.He was author of a series of books of devotion that went through numerous editions, some being reprinted twelve and others as twenty times.Among the more notable were “The Dove of the Tabernacle”,” Mary Immaculate,” “Purgatory” and a “Life of St Joseph”.He also composed a ” Life of St Patrick” and an account of the martyred Archbishop Dermot O’Hurley, beatified many years later in 1992.He established the Confraternity of the Holy Face in the parish. He presented stained glass windows to the Convent Chapel and to the chapel in St Patrick’s Hospital.He was lavish in his charities out of the income his writings earned for him.He died on 8 May 1913; he was buried, as he wished, in front of the Holy Face Shrine. ‘Hore’ is thought to derive from ‘iubhair’ – yew tree. Originally founded by the Benedictine order in 1266, Hore Abbey was given to the Cistercian monks from Mellifont Abbey in 1272 by David McCarvill, Archbishop of nearby Cashel. Tradition says that McCarvill expelled the Benedictine monks after he had a dream that they were about to kill him. He endowed the Abbey generously with land, mills and other buildings previously belonging to the town, which caused local resentment. 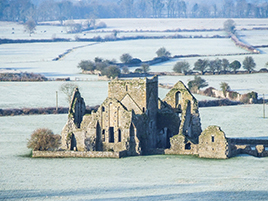 The Abbey was the last pre-Reformation Cistercian foundation in Ireland. It was never prosperous; at the time of the Dissolution the annual income of the abbey was valued at just £21. This path way between the Rock of Cashel and the Camas Road- with an entrance gate near the Rock beside the entrance gate to the Cashel Palace- was the route used for funerals in bygone days i. e. People were brought this way from the town itself to be buried at the Rock. Situated about 150 metres from the Rock, this ancient well is named after the Virgin Mary. It was in use as a place of pilgrimage until late in the 19th century, and is right beside the old Dublin road. Up to about 40 years ago, when their was at times problems with water supply in Cashel, people could still be seen bringing water from the well in buckets for their own use. The Famine Wall was built as part of the Town Improvements carried out by the Commissioners after their law officer, Michael Doheny, won compensation from the Landlords in the years following 1842. Opened in 1795, Cashel Parish Church is one of the oldest Catholic churches in present day Ireland. The church was built on the site of the Franciscan Friary. The original friary was known as Hacketts Abbey and was originally built in 1265.The original structure was a plain rectangular building, divided into three sections at ground level, resembling the basic plan of an ancient Roman basilica. For over one hundred years the church was almost totally devoid of seating on the ground floor. The cut stone facade and the bell tower were added during the time of Dean James McDonnell (P.P. 1831-1855). The mosaics were added in 1932 to the facade to commemorate the Eucharistic Congress. The interior of the church contains sculptures along both sides of the main aisle, sponsored by local families in remembrance of deceased family members. The church celebrated its bi- centenary in 1995. The original structure of this church dates from the late eighteenth century and was designed by the noted Waterford architect, John Roberts, while the tympanum and other embellishments were added in 1850 by another well-known architect, W.G Doolin. It occupies a prominent site on Friar Street and is an imposing feature in Cashel’s townscape. Its regular façade incorporates classical elements such as the arcade, colonnettes and pediments. The enamelling and gilding add artistic interest and contrast with the more austere classical features and well-crafted limestone. The ornate interior is of considerable interest, especially in the arrangement and decoration of the galleries, and the profusion of religious statues and stained glass. The church stands on part of the site of the town’s medieval Franciscan friary, thus forming part of many centuries of religious worship at this location. The Bothan Scoir (Peasant Dwelling) is a preserved 17th century tenant cottage dating from around 1640. It is the last of ten small farm labourer’s dwelling that once stood here. Four of them were built of stone, similar to this one and had thatched roofs, the rest were made of mud and wattles. The Labourer’s cottage or Bothán Scóir was a small, basic, one roomed cottage. They were typically built on a half acre which was rented to them by the farm owner. The occupant would then work on the farm for a certain number of days as rent – typically about 80 days in the year. The rest of the time they farmed their own patch. They couldn’t afford their own livestock save for a few hens or ducks. Often the wife of the labourer found work in the kitchens of the larger farmhouse. The floors for were typically constructed of compacted mud. The walls were constructed from stone, mud or even peat in poorer boggy areas. The furnishings of the Bothán where relatively meager and minimalist as space was at a premium. A falling table would be affixed to the wall and folded up at night. The hearth was at floor level with a canopy constructed of wattle and daub. Cubby holes were carved out into the walls as clever, unobtrusive storage for pots. A hanging dresser or clevvy was attached to the walls to hold the crockery and most coveted goods of the family such as the Child of Prague. Opposite the Bothán is “The Gouts Pool (Ducking Pond)”. Here ladies of the night were punished for unsociable behaviour by being ducked in public. Agar’s Lane, named after Archbishop Charles Agar(1735-1809), was build by him around 1795 to provide access between St.John the Baptist Cathedral on John Street and the new Catholic chapel built on the site of the Franciscan Friary on Friar Street. Charles Agar came from a landowning family with ties to Kilkenny. He was Archbishop of Cashel between 1779 and 1801, after which he was appointed Archbishop of Dublin. Archaeological excavations conducted in 1999-2000, revealed the laneways original cobbled surface. Remains of seven adult burials were found, believed to be part of a medieval graveyard associated with buildings that preceded St.John the Baptist Cathedral, which were also discovered in the excavations. The Cathedral Church of St. John The Baptist was built to supersede the Cathedral on the Rock, to become one of two Anglican cathedrals built in Ireland or Britain in the eighteenth century, the other being at Waterford. The new foundations were laid in 1759 on the site of the Medieval Parish Church of St. John the Baptist. However, the building was not completed until 1784 when Archbishop Charles Agar came to the See. Its Georgian style is evidenced by the regular form, hipped roof and round-headed openings and by the incorporation of Classical elements such as the aedicule, pediment and pilasters. There is evidence of fine stone crafting throughout the building. The spire was added by Vitruvius Morrison in 1812, the chancel was remodelled in a gilded elaborate Italian Romanesque style by William Atkins and the organ is by Samuel Green. The curiously unfinished south side of the entrance front, and the different elevations to the long north and south walls, are all of particular interest and perhaps reflect a desire to lavish attention on the parts of the building immediately visible on the approach from John Street. It forms a nationally important precinct with the library, gates and gate lodge. The tall spire ensures that the building is visible from afar and constitutes one of the most imposing features in the Cashel townscape. A model of the Cathedral in Cashel is depicted on the tomb of Archbishop Agar in Westminster Abbey. The Bolton Library contained a unique collection of antiquarian books and housed the finest collection outside of Dublin. In 1729, Archbishop Theophilus Bolton was promoted to Cashel. The books were collected by him from 1730 to 1744. In his will of 1744 he bequeathed around six thousand volumes to the Cashel diocese. The collection contains a wide range of subjects and includes a 12th century manuscript, the Nuremnberg Chronicle and works by Dante, Swift, Calvin, Erasmus and Machiavelli. Also on display were maps and church silver, it also housed the smallest book in europe. Also on display was one of the earliest English printings, a 1486 edition of one of Chaucer’s works, printed by William Claxton. The books were originally installed in a long room to the west of the Palace. they were moved to their present location in the Chapter House situated in the grounds of the Cathedral Church of St. patrick’s Rock and St. John the Baptist in John Street in 1836. the Building was renovated in 1986. Cashel like many Irish towns had surrounding walls built to protect the population from attack. The medieval city wall were built under a Charter of Murnage from Edward II between 1319 – 1324 and enclosed an irregular heart-shaped area of about 28 acres, the circumference being just over one mile in length. In time they came to mark the boundaries of the town, and in doing so helped in the levying of tolls and fees on traders. There is evidence of mural towers at the north west and south east angles, and there were also at least five gates: Canafie Gate and West Gate (or St. Nicholas’ Gate) at the east and west ends of Main street; Moor gate in Chapel Lane; and on the south side of the town, Friar gate and John’s Gaye located at the ends of Friar Street and John Street. The Hackett Effigies can be found inlaid into the town walls on the grounds. The Effigies themselves are four thirteenth century coffin lids that were taken in the eighteenth century from St. Dominic’s Abbey and placed in the south and east boundaries of the wall. They were placed there for their preservation and are thought to be of Sir William Hackett (circa 1260), his wife and family. Cashel Town Council have erected all over Cashel Town signs, plaques and maps to help residents and visitors find all these hidden and not so hidden treasures that Cashel has to offer.